Irving, Texas is a highly populated city with a population of 232,013 people. Irving has a population density of 3,460 people per square mile. This would be considered well above the national population density level. More than a quarter of the residents of Irving identify themselves as Hispanic or Latino, and 37% of the population speak Spanish as their primary or secondary language. If you are a young adult or student, you might be pleased to know that the average age of all Irving residents is 32. 70% of the people in Irving (over the age of 15) are married and 47% have kids under the age of eighteen. Knowing that, it’s safe to say that this area could be a great place for other families to lay down roots. Without the right tools, moving to any new area can be very stressful and challenging. Living in Irving, Texas could be a positive experience for anyone who puts in the effort to do the research required. Finding the best places to live in Irving and nearby areas is a much easier task when you can rely on information and data from the livability score, which includes amenities, cost of living, weather, education, employment and other important metrics. Using data and statistics Irving has received a livability score of 86/100. This score is ranked in the 99th percentile when compared to all other cities. Pack your bags! This is a very high score in comparison to other US cities. Living in Irving could be a great choice! This city is also ranked in the top 10 percentile of all cities across the USA. 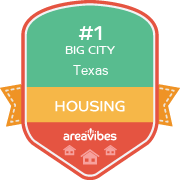 If we dig a little deeper into each category within the livability score, we see that Irving has higher than average grades for the following: amenities (A+), crime (B-), weather (B), education (A-) and housing (A+). Based on the proximity of local amenities like grocery stores, restaurants, coffee shops, parks, librairies, etc., Irving has received a higher than average score for its local amenities. If you’re planning on relocating and making this area your permanent home, it’s nice to know that there is an ample amount of amenities and things to do within walking distance or a short drive. Some of the notable things to do include: Mustangs of Las Colinas, Mandalay Canal, and Ripley's Believe it or Not. The average school test scores in Irving are 71%. This far exceeds the national average and ensures that this educational system will provide your children with the skills and the tools they need to thrive. Finding affordable real estate and apartments for rent in Irving can be tricky. Having said that, this area might be the place to get the best of both worlds. Based on factors like home/rental affordability and appreciation rates, this area has received an above average score in the housing category. Being close to public transportation, grocery stores, parks and other conveniences are all important when weighing your options for a new home in Irving. Before you determine if any of these amenities are available in the area, you will also want to know if the real estate prices in Irving are affordable. Median real estate prices in Irving come in at $147,500, which is 3.4% higher than the Texas average. The home price to income ratio compares the median home prices to the median household income. In Irving, the home price to income ratio is 2.7, which is 3.8% higher than the Texas average. Knowing if your home will appreciate on a long term or even a short term basis should be factored into your decision making. An increase in your home’s value can be a good way to generate tax-free equity that can create long term financial security. In the past year, appreciation rates for homes in the Irving area were 11% and 5 year appreciation rates were 10.2%. How Do You Rate The Livability In Irving? The water service bill every month is due in a different date, their day ends at 5PM because if you pay online after 5 PM they will charge a fee of 10% to 12% of your bill.The day ends at Midnight everywhere but not in the City of Irving departments. Their customer service don't care, they say it is what it is. So is it right make people pay a late fee WHEN THEY ARE NOT LATE ON THE PAYMENTS?? Irving, TX, home of the Dallas Cowboys, has some great activities and attractions for everyone in the family. We drive through Irving every now and then, and enjoy seeing the sites. Sports fans, like my husband, enjoy driving by the old Dallas Cowboys Stadium, which is now just a pile of rubble. Speaking from experience, feel free to take photos, but do not try to cross the highway or climb over the fence. My boys enjoy the National Scouting Museum located right beside the Boy Scouts of America headquarters. This Iriving museum is full of great photos and exhibits, and is the official Boy Scouts museum. The building itself is state of the art and has a Norman Rockwell art gallery. The kids enjoy the hands on activities, and I like it because there's not really anything they can break. Unless you are an extreme horse lover I recommend skipping the Las Colinas Equestrian Center in Irving. There are some nice horse statues to view, but it is a bit boring. If you enjoy horse statues I suggest visiting the Mustangs of Las Colinas instead. The great thing about Irving is it is surrounded by other cities with fantastic activities and other fun attractions. Arlington is just 7 miles away and has Six Flags Over Texas. Dallas is five miles away and has an amazing kids science museum. Fort Worth is seventeen miles away and includes one of the world's greatest zoos, the Fort Worth Zoo. All of the areas and towns in the Irving area really blend together and you can't tell where one ends and the other begins. It is all one big, fun filled city. Source: The Irving, TX data and statistics displayed above are derived from the 2016 United States Census Bureau American Community Survey (ACS).